The micro-brew family in Tacoma, WA just got a little larger. 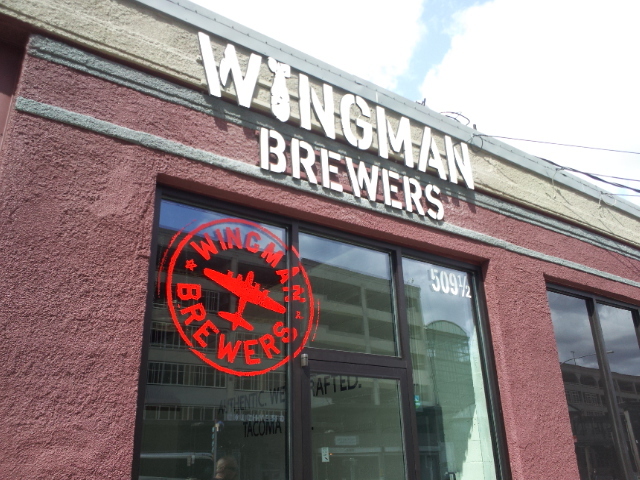 Wingman Brewing has been making and distributing their creations to local pubs and markets since April of 2011 but, alas, had no tasting room of their own. Flash forward one year to April 21st, 2012 to the opening of Wingman Brewing’s very own tasting room. Original brick walls surround the room and vintage-style Wingman posters are plastered on the walls. But the best part is the beer! Falconer’s Flight Single Hop IPA (6.8% ABV) – Dark peach color. Belgian yeasty aroma. Great hop, nicely balanced. Crisp with smooth finish. Ace IPA (7.4% ABV) – This one was my favorite. Mellow with aroma of grapefruit and flowers. Hoppy, but not too hoppy, with hints of caramel. Clean finish. P-51 Porter (8.0% ABV) – Dark brown (almost black) color with a tan head. Rich chocolate and coffee aroma. Malty, creamy, and full of chocolate flavors. This is a nice sipping beer. Belgian Double (8.4% ABV) – Thinner mouth feel than the others yet very sickening sweet. Dark brown color. Spice notes in the aroma and flavor with a slightly sour finish. This was an interesting beer, but too not one of my favorites. Stratofortress (11.4% ABV) – Wingman took the Belgian Double and aged it in oak. Though much higher in alcohol than the Double, in this form it was much more drinkable. Slightly medicinal aroma. Sweet and sour taste with a malty balance. It’s amazing what a little oak can do! As you can see Wingman is really into “big” beers. The alcohol does not go below 6% ABV. It’s my hope they will look to brew something lower in ABV that won’t cause the casual drinker to lose their faculties after one pint. A nice wheat, pale ale or pilsner perhaps (hint, hint). The tasting room is huge! There is a lot of seating around the bar but a lot of open space that could be utilized for more seating. But hey, they just opened. They may have more great plans for the tasting room in the works. Wingman does not prepare food but the New Frontier Lounge down the street will be more than happy to deliver pizza right to the taproom door. The taproom is open Thursday through Saturday from 2:00pm-11:00pm.